A couple of days ago a heavy pollution mist hung over London but it was made beautiful by the largest sun you can imagine. I don't think I have ever seen it so large in this part of the world. It slowly melted down over the buildings in the distance. At one point looking like a large lollipop as it slithered down a crane in the distance. Beautiful shot! I noticed this too, I was in New Cross Gate walking to the station and the sun was coming down. It was so big and orange! It was so surreal! Reminded me of the sun rises in pakistan. Pollution is a sad part of our lives but that sure is one fantastic photo. Thanks for sharing with Sky Watch Friday. Wow - that is something else!!! You managed to get a few birds swirling around admiring the sun, too! Very nice. I like your composition. This has a water color effect. Beautiful photo and your description was perfect. What a lovely shot...although the pollution problem is unfortunate. I always hate seeing smoggy skies and knowing that I'm breathing all that yucky stuff in! Love photo - great sky! Beautiful scenery!Love that huge sun hanging over the water, some ships and perfect colors. Interesting the difference between this harmonic shot and the polluted mist. There have been quite a few amazing sunsets in London the past 3-4 weeks. 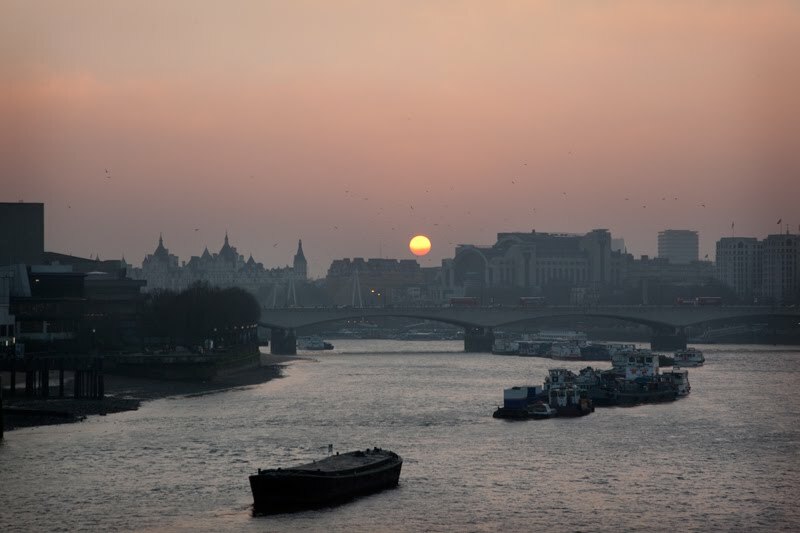 It is a beautiful shot, with the London skyline silhouetted and that amazingly big sun!